they will sell 3 pairs of this thing…by mistake. In 20 yrs, there will be a millennium exposition at the MOMA – and the “iCarta” will be one of the centerpieces. It’s a good idea only if it lets you play nothing but Kenny G.
Turd, I was thinking the asme thing. There is no doubt that Ampar is the MacDaddy of MDN comments. I’ll wait for the iPhone. Then I can have my Cake and Beat It, too. No, that would make me constipated, from constant, defensive clenching. Lets just pray that no future civilization will dig this thing out. They will get a very skewed picture of our culture. Umm…wait a minute, let them dig this thing out…I thing it’s pretty spot on after all. does it have its own IP? Genius. Pure Genius. I’m going to wait for version two with the wide screen monitor and popcorn maker. You’ll be able to watch horror movies and literally scare the sh*t out of yourself. This must be for people who are anti-Apple… it will certainly give them the s***ts at least. Nothing I like more than AC cables dangling near the toilet I’m sitting on/peeing into. Look at your bathroom. Is there an outlet near the toilet paper dispenser? How long is this AC cable? Will most people need to use an extension cord? Is the cable white or black? 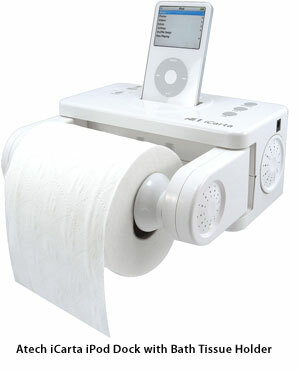 andy: Would you prefer “bog roll”?